. : Farm Forest Line - Farm Forestry case studies:. Seeing is believing. 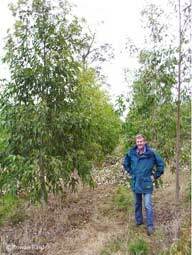 The practical experiences of the many farmers, foresters and researchers who are actively involved in farm forestry provide us all with greater knowledge and confidence about the potential of farm forestry. Examples from our own local area can shed light on species selection, growth rates and market opportunities. Experience from further afield can highlight new market opportunities, innovative designs or management techniques. These are the stories that make farm forestry real. This page provides links to case studies prepared by agencies, organisations, Farm Forest Line and the farmers themselves. They show how farmers have been able to design farm forestry projects aimed at solving real farming problems and opening up new economic opportunities. Some provide real data on performance, yields and returns. Reports based on demonstration sites and research trials provide more examples and in some cases comparative data on species performance and management options. You are welcome to add a case study. Simply email us with a link to your web site or send us your story and photos so that we can construct a new page. If possible, provide details on location, management objectives and performance. Measurements, observations and information on the benefits provided or problems faced can make your case studies more useful for others.